The funds will be used to increase the number of students earning industry-recognized credentials and degrees required to enter and advance in the workforce for targeted industries such as advanced manufacturing, aviation maintenance, welding, cybersecurity/information technology, nursing, transportation and construction trades. The Florida Job Growth Grant Fund was established by Scott and the state Legislature in 2017 to encourage continued economic growth statewide. More than 225 grant proposals, requesting more than $821 million in funding, were submitted and reviewed by the Florida Department of Economic Opportunity, Enterprise Florida and chosen by Scott based on their strong return on investment to the state and to meet the demand for a robust workforce or infrastructure needs. The Greater Pensacola Career Pathways initiative with Pensacola State College as lead, will be implemented in partnership with George Stone Technical Center and the Escambia County School District, CareerSource ESCAROSA and FloridaWest Economic Development Alliance. Malcolm Thomas, superintendent of Escambia County School District, said Escambia County Schools, including George Stone Technical Center, are thrilled to be included in the Greater Pensacola Career Pathways initiative. Gulf Power Co., GBSI, VT Mobile Aerospace Engineering, Skanska, Baptist Hospital, AppRiver, Techsoft, Home Builders Association of West Florida, Northwest Florida Manufacturers Council and IT Gulf Coast and Innovation Coast, also collaborated on the proposal. “FloridaWest thanks the Governor and the FLDEO for this grant which will enable area students to take advantage of great career opportunities in high wage growth areas and diversify our workforce for future projects,” said Scott Luth, CEO of FloridaWest. 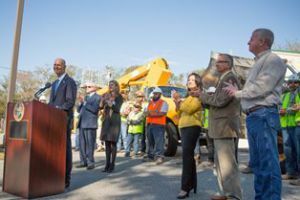 The governor made the announcement in Jacksonville which was awarded $6 million for the construction of a new 1.5-mile access roadway to the city-owned Cecil Commerce Center Mega Site to provide access for the manufacturing industry. Canaveral Port Authority: $8.24 million. The governor’s recommended 2018-19 budget includes an additional $85 million in continuation funding for the Florida Job Growth Grant Fund. “Florida is competing in a global economy, and we must do everything we can to ensure our state remains the top destination for families and job creators to succeed,” Scott said in the release. Gov. Rick Scott announced the recipients of $35 million in Florida Job Growth Grant Funds on Tuesday in Jacksonville. Pensacola State College received $1.86 million for workforce training programs from the $85 million grant fund. The college was among nine entities awarded $35 million of the total funding.